John Bradley knew the group was nervous. During lunch they had talked about kayak surfing, but they were hesitant to try it, even though it was a beautiful day in Windward Oahu. They wanted to see Bradley do it, and if all went well, they said they would follow. Bradley, their guide on Twogood Kayaks' Guided Kayak Eco-Tour, was happy to oblige. Out he went, riding the first good wave to within 30 feet of their lunch spot. "They were impressed but still pretty timid," Bradley recalls. "Finally, the smallest girl in the group, who weighed all of 105 pounds, volunteered to be the guinea pig. In short order we were on a tandem kayak, lined up for a wave, and got a fantastic ride! During the ride she was screaming and laughing frantically at the same time. Her excitement got the rest of the group on their kayaks in no time." After a little coaching, all of them were catching waves and having a blast; they kept begging Bradley for "just one more ride." Before they knew it, 45 minutes had passed. "It made us late getting back," Bradley says with a smile, "but it was so worth it to hear the enthusiasm in their voices as they kept talking about their rides and how they would remember them as the best time they had on their Oahu vacations." A Hawaiian monk seal basks in the sun on Moku Nui, one of the Mokulua islets off Kailua Beach and a stop on a Twogood Kayaks tour. According to Bob Twogood, most of the visitors who have gone on the Guided Kayak Eco-Tour have expressed that same feeling. A former national kayaking champion, he founded Twogood Kayaks in 1982 as a small paddle-building business based in the garage of his Kaneohe home. Since then it has evolved into the most diversified paddle sports company in Hawaii (see accompanying information box). 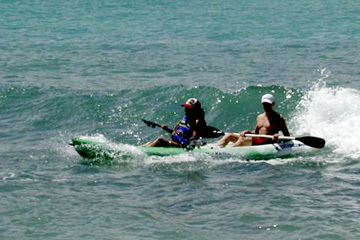 In 1987, Twogood and Kay Witt, a fellow kayaker and science teacher at Punahou School, launched the Interscholastic League of Honolulu's competitive kayaking program, which draws 250 high school students each year and is the reason Honolulu has boasted more kayaking athletes on national and Olympic teams in the past 15 years than any other American city. The following year, Twogood developed "Kayaking Basics and Beyond" for the University of Hawaii at Manoa's Outreach College, a noncredit course open to the public. He continues to instruct that class today. Twogood Kayaks started offering guided tours in 1992. "Our guides are all master paddlers who are trained and certified in lifeguarding and first aid," says Twogood. "They also have a solid background in marine life, seabirds and the history and geology of Kailua, the Koolau Mountains and the offshore islets of Moku Nui and Moku Iki. Even people who live on Oahu would really appreciate learning about these things while they're having a fun day kayaking!" There's time to explore tidal pools. TOUR PARTICIPANTS' playground is tranquil, reef-protected Kailua Bay, which Twogood asserts is the best destination on Oahu for paddling. Winter temperatures here average in the high 70s, and during the summer, the mercury hovers around the mid- to upper 80s. Abundant marine life provides additional thrills. You'll see spinner dolphins; Hawaiian green sea turtles; spiny sea urchins; eels; a host of tropical fish, including the convict tang, weke, angelfish, parrotfish and humuhumunukunukuapuaa (triggerfish); and the pristine coral reef that harbors them all. Seabirds also frequent Kailua Bay, the most common being the wedge-tailed shearwater, which nests on Moku Nui from June through August. Red-footed boobies, sooty terns and iwa (frigate birds) also call this magnificent area home, and this time of year, you might spot humpback whales frolicking in the distance. For many the highlight of the Guided Kayak Eco-Tour is reaching "the Mokes," the Mokulua islets, which float a little more than a mile from the tour's starting point at Kailua Beach Park. Although visitors aren't allowed on Moku Iki, the smaller islet, because it's a marine life sanctuary, they enjoy the stop on Moku Nui. 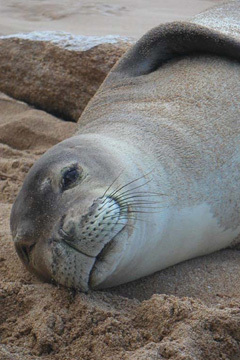 Notes Twogood, "The island has a large beach on the front side, where the endangered Hawaiian monk seal sometimes likes to lounge. It also has a cave with a beach on its east side that can only be entered on very calm days by swimming into it. There's a cove on the back side that we walk to on calm days. Guests love to dive into a pool from a low-level cliff here; it's a great swimming and snorkeling spot!" Matt Stevens goes kayak surfing with a guest on a guided Twogood Kayaks eco-tour. Many guests are initially hesitant to try it, but often end up begging for "just one more ride." CONTRARY TO popular belief, tour participants don't have to be strong swimmers. "Everyone who goes on our tours or rents a kayak from us is required to wear a life jacket," Twogood says. "When we rent kayaks, we first do a briefing with each customer that explains which areas are safe and which ones should be avoided. On the guided tour, we make sure participants paddle only in the safest waters. We have a perfect safety record." Inevitably, Twogood says, when nonswimmers discover how stable the kayaks are, how good the guides are at putting them at ease and how fun and easy the trip is, they can't believe they waited so long to get out on the ocean. "Some of them even surf a few waves!" he says. Ask Twogood why he loves kayaking, and he responds without hesitation. "It can be anything you want it to be," he says. "It can be a leisurely paddle on placid waters with a view that people pay millions for, a team-building activity with friends or co-workers, a workout that tests the most athletic individual, or anything in between. "For me the reward is the intimate connection I get with the ocean when I'm in a kayak. It's peaceful and exhilarating at the same time. You feel every ripple, every gust of wind, and nothing in the world exists except you and the ocean." Cost: $109 per person, including use of a kayak, padded backrest, dry bag and life jacket; snorkeling gear; picnic lunch (submarine sandwich, chips and a drink); and round-trip transportation from and to Waikiki. The minimum age requirement is seven; children who wish to paddle on their own must be at least 14. Kamaaina pay $89 if they provide their own transportation to Twogood Kayaks. Notes: Single kayaks can accommodate paddlers weighing 75 to 350 pounds. Double kayaks are available for couples and parents who wish to paddle with a child. The tour is appropriate for people of average physical condition. Twogood Kayak's guides have a towline to help couch potatoes and others who need it. Wear a swimsuit, T-shirt, shorts and footwear suited for water and land. Bring a towel, sunscreen, sunglasses, hat or visor, water bottle and a change of clothes. Twogood Kayaks also offers a self-guided Adventure Package and Turtle Safari. Call for details about these tours as well as kayak, bodyboard and snorkeling equipment rentals; kayak race and ocean skills camps; and programs covering kayaking safety, kayak basics and racing clinics. The company also sells sit-on-top recreational kayaks and accessories, and manufactures custom-built, high-performance surf skis. Originally designed as lifeguard rescue craft, surf skis now are used as open-ocean racing kayaks because of their speed, agility and seaworthiness. Twogood Kayaks' graphite and fiberglass racing surf skis have won 14 World Championships since 1982, more than any other surf-ski manufacturer worldwide.